Like the look and style of Marc Jacobs products? If you're also looking for a smartwatch, you're in luck, as the brand has just introduced its first ever Wear OS watch. 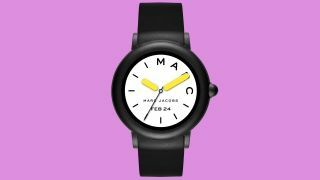 The Marc Jacobs Riley Touchscreen smartwatch joins the brand's variety of hybrid smartwatches, but unlike them it features a full color display. We don't currently know any exact specs on the display though, aside from the fact that it's a touchscreen. This watch features a polished metal case with a silicone strap and has one button on the right hand side where you'd find the crown on a traditional watch. There are currently three design choices: a black case and strap (which you can see in the image above), a gold-tone case with a white silicone strap and a rose gold-tone case with a grey silicone strap. You can then further customize the wearable with a variety of watch face choices available from the brand. In fact, Marc Jacobs says there are over a thousand face options for you to switch up your wrist's look. We don't currently know all of the specs for the new device, but we know it includes the Qualcomm Snapdragon Wear 2100 chipset inside, which we've seen on almost all Wear OS watches over the last few years. You'll have all of the features of Google's own Wear OS platform, so you'll be able to play music, receive notifications and speak to Google Assistant directly from the watch, but it'll have to be paired with your phone to do most of that. It'll work with both Android and iOS devices. We don't currently know the size of the battery, but Marc Jacobs says it'll last up to 24 hours from a single charge. That doesn't sound overly promising, so we'll be sure to test it properly when we review the watch. You won't be able to buy the Marc Jacobs Riley smartwatch until later this year, with it launching in the UK in July. The availability around the rest of the world is yet to be confirmed. In the UK it will be sold at ASOS for £269 (about $360 / AU$470), so it's up there with the more expensive smartwatches we've seen from fashion brands in the last year or two.